Getting back into the swing of my day job after the Holiday break has slowed me down in The Kitch. Time to cook and bake, and photograph my culinary creations has become scarce; but that's not to say things have come to a complete halt — I baked more cookies. 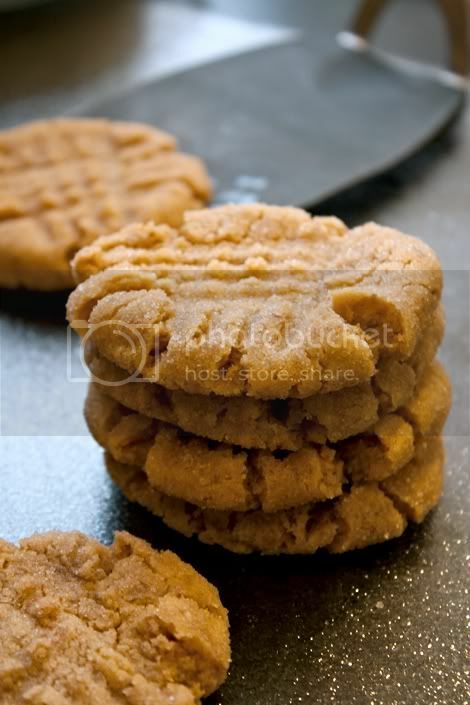 Actually, they were Super Moist Peanut Butter Cookies that came out so amazing, I recommend you stop everything and make them right away. Because even when time is scarce, no one doesn't have time to make an amazing super-moist batch of cookies! To start: Preheat the oven to 350°F. Line a baking sheet with parchment paper; set aside. In a small bowl, beat the flax meal and water together with a fork or wire whisk until gelatinous and gooey, similar to egg whites; set aside. Mix the dough: In a large mixing bowl, cream the Earth Balance, peanut butter, granulated sugar and brown sugar together with a wooden spoon until combined. Add in the flax/water mixture, almond milk and vanilla, and mix until combined. Add the baking soda and salt, then add the flour about 1 cup at a time mixing by hand with a wooden spoon until dough is thick and stiff enough to roll into balls — use some elbow grease! Add more flour if needed. Make the cookies: Roll balls of dough (I use a regular spoon to gather the same amount of dough each time, then roll it between the palms of my hand), and roll balls in the small bowl of sugar you've set aside. Arrange balls on cookie sheet and bake for 6-8 min. Remove from the oven and score balls with the back of a fork, making an X pattern on each one. Return to oven and bake 2-3 more minutes, being very careful not to over-bake. Wait a few minutes before removing from tray with a spatula and transferring to the counter or a wire rack to cool.